Many people have asked me several times what is a nurnie? Nurnies are the small technical parts of an object. You’ve probably seen them in almost any Sci-Fi movies that try to depict the future. Or maybe you have heard them called greebles by other modelers. It just depends on what term we learned to call the small technical pieces. I tried to dig up as much information on nurnies to write this article but there seem to be a mystery about the origin of the name. One FX group in the UK who built the space ship for “2001: A Space Odyssey” called them wiggets. So finding a definite answer about these little simple things can be a problem. 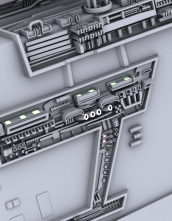 But what I do know is adding this detail to your models can change the whole look of your design. Good nurnies come in every shape size and complexity. If your not sure of how to make them then get some good reference materials from the internet. Good nurnies will add to the scale of your design. Keep in mind while you model these small detail parts that they can make your polygon count grow. Try and build your shapes with as few polygons as you can. On some of my models I delete the polygon that is facing the object to reduce the polygon count. If your making pipes try and only use 8-10 sided disc for your object this will defiantly help.